In the early hours of July 23rd a Yellow Kenworth stopped behind the tail of the Boeing 747-438 VH-OJA which sits proudly at the Historical Aircraft Restoration Society (HARS) facility at Albion Park. It was what was on the low loader of the Kenworth that had just arrived from RAAF Richmond that was of interest. Sitting on the deck of the low loader banking slightly to the left sits the cockpit and forward fuselage of the former R.A.A.F Boeing 707-338C A20-627. Handed over to the R.A.A.F on April 7, 1979 in a basic QANTAS livery with R.A.A.F Roundels the aircraft became part of No 33 Squadron for use in the V.I.P Transport role. Subsequently named ‘Windsor Town’ the aircraft flew proudly with the squadron flying some 12,175 hours until retirement on February 21st 2001. The airframe was used as a source of spares for the remaining fleet till their retirement and the airframe was scrapped at R.A.A.F Richmond in December of 2009. The aircraft started its career in Australia much earlier however when it rolled of the production line at Boeings Renton Field in April 2nd 1968 as VH-EAG for QANTAS. Accepted by QANTAS at Seattle in May 11 1968 and named the ‘City of Hobart’ the aircraft left Seattle as QF051D and arrived in Sydney on May 18. A small claim for the airframe is it was the first 707 to land at Melbourne’s Tullamarine airport. 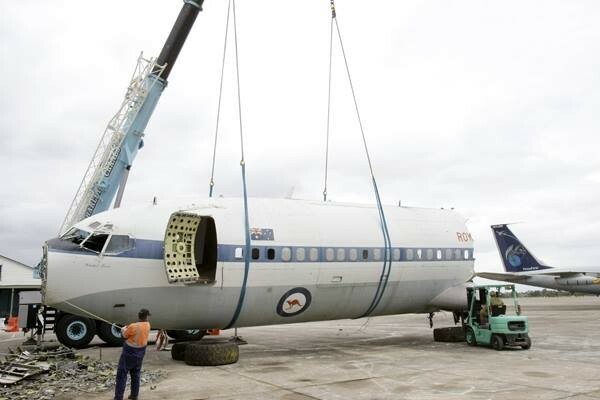 Re named ‘Alice Springs in February 1974 the aircraft was used in the evacuation relief flights during Cyclone Tracey. VH-EAG had the distinction of operating the last QANTAS flight from Melbourne to Sydney as QF16P on March 26 1979. It was cancelled from the Australian register on March 1979. Now in the collection of HARS at Albion Park, the team wish to display the aircraft in a tribute to both its R.A.A.F and QANTAS careers. One side of the aircraft will have the QANTAS scheme the other R.A.A.F. Joining the HARS collection allows the aircraft to sit alongside the previously mentioned 747-438 VH-OJA and the flying Lockheed Constellation VH-EAG. A fitting tribute to the remains of the airframe. The image comes straight from Defence.